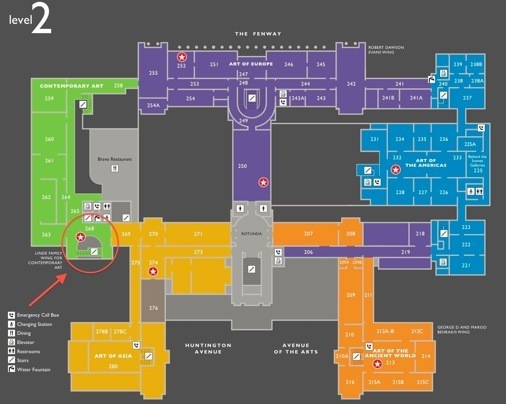 FREE and open to the public | Gallery 268. Georgie Friedman stages site-specific, immersive installations that evoke the beauty of the natural world and point to the uncertain future of a warming planet. Through explorations of man-made climate change, Friedman’s artwork addresses the effects of a global crisis on one of the most fragile landscapes on Earth. Friedman received a 2017 Traveling Fellowship from the School of the Museum of Fine Arts at Tufts University, and voyaged to the Antarctic Peninsula to gain first-hand experience documenting the desolate beauty of the polar region. During her expedition, Friedman sketched the environment, recorded video footage, and photographed the Peninsula, which are all integral components of this exhibition. “Georgie Friedman: Fragments of Antarctica” combines many experiential elements from Friedman’s travels. A two-channel video piece, featuring gigantic icebergs floating out to sea, pairs incongruous seascapes to create a sense of unsteady footing and a desire to level the horizon. Friedman’s photographic typology of singular icebergs—from the enormous and seemingly insurmountable to the rapidly fleeting—challenges our sense of scale. Her constructed panoramic views present a fragmented relationship with the natural world, moving from a large-scale perspective towards an increasingly intimate view of the volcanic mountains, glaciers, icebergs, and physical remains of the region. Across the gallery, kinetic sculptures that reference the shape of icebergs are suspended from above. The thin metal sculptures depict both the visible portions of the icebergs and also the 90 percent of each iceberg that is typically submerged under the surface of the water. Visitors encounter the sculptures from below, inverting our typical vantage point and creating a challenging new perspective of the icescape. The exhibition presents fragments of a shrinking continent and raises questions about the need to document an ecology in peril. 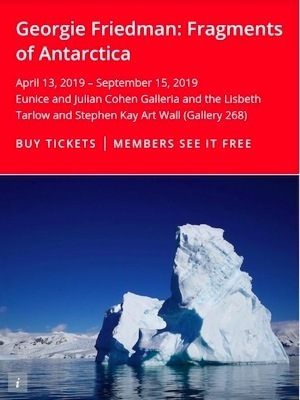 “Georgie Friedman: Fragments of Antarctica” invites visitors to reflect on their own relationship with the natural world—and consider an ice-bound landscape under threat by sweeping global changes. To receive updates about this or other exhibitions, please sign up for the mailing list.